Today, the United Nations Human Rights Committee (UNHRC) decided its first abortion case, Karen Llontoy v. Peru. The decision establishes that denying access to legal abortion violates women’s most basic human rights. This is the first time an international human rights body has held a government accountable for failing to ensure access to legal abortion services. The Human Rights Committee monitors countries’ compliance with the International Covenant on Civil and Political Rights. "We are thrilled that the UNHRC has ruled in favor of protecting women’s most essential human rights," says Luisa Cabal, Director of the International Legal Program at the Center for Reproductive Rights. "Every woman who lives in any of the 154 countries that are party to this treaty – including the U.S – now has a legal tool to use in defense of her rights. This ruling establishes that it is not enough to just grant a right on paper. Where abortion is legal it is governments’ duty to ensure that women have access to it." My friends Erin, Jen and Tara have been sewing feverishly for the past few months. 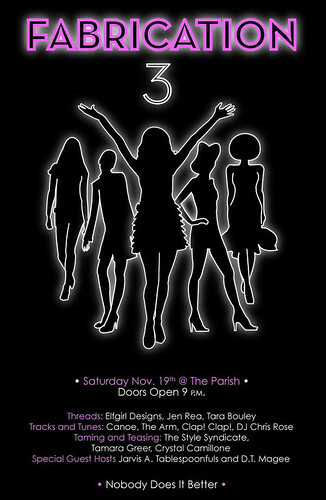 Saturday November 19th at the Parish. Doors 9:00... fashion show at 10 ish. Tix are $6 in advance (waterloo records or frontgatetickets.com), $8 at the door. Five L.A. Derby Dolls were cast for the production of a CSI: NY episode that will air Wednesday, November 30, 2005. Tara Armov was cast as a referee, Dita Slayworth, Molly Hatchett, and Frita Fondle were cast as skaters, and Redjenn was cast as the coach for the Brooklyn Clobbers. The story was about two roller derby teams, the Manhattan Minx and the Brooklyn Clobbers, who play a vicious game, and the star of the Manhattan Minx, “She Hate Me”, ends up dead after a full on brawl and pile up. A&Es reality show Rollergirls staring the Lonestar Rollergirls airs January 2, 2006. Alamo City Rollergirls exhibition bout a success. Listen to episode one of Radio Free Derby. The banked track Lonestar Rollergirls will be skating all five of their team in a single elimination tournament this Sunday, November 20th. The action starts with the Cherry Bombs skating against the Hellcats in a six jam mini-bout. The next match features the Holy Rollers vs. Putas del Fuego. The winners of the first two bouts will face off for a chance to skate against last years Calvello Cup winners the Rhinestone Cowgirls. Please visit the Lonestar Rollergirls website for more info. Iraqi detainees thrown to the lions. More than 35,000 Iraqis have been detained by American troops since the invasion of the country but only a tiny fraction have been convicted of wrongdoing, the Guardian has learned. The flat track Rocky Mountain Rollergirls will skate this Saturday, November 19th. This will be a round robin bout with the two established teams taking on the new Varsity Bruise squad. Bladium Sports Club, 2400 Cenral Park Blvd., Denver, CO.
Tickets are $11 in advance, $13 at the door. Doors open at 6pm, bout at 6:30pm. Please visit the Rocky Mountain Rollergirls website for more info. 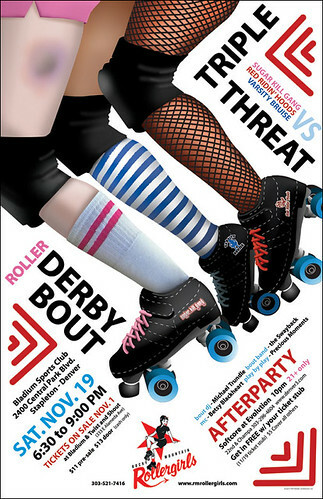 The flat track Arizona Roller Derby skates this Saturday, November 19th. Please visit the Arizona Roller Derby website for more info. The first podcast of Radio Free Derby is up. Suburban Guerrilla - 20 Amazing Facts About Voting In The U.S.